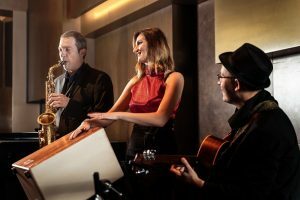 A new trio is performing at Grand Hyatt Macau, jazzing up the evenings of the hotel’s Lobby Lounge. 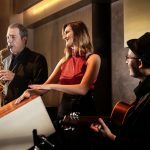 Formed by three talented musicians from Italy, the Kiara, Matt and Gabriele trio is a unique, acoustic blend of several instruments, including hand percussion (Cajon), guitar, saxophone and piano. The trio has performed before at Grand Hyatt Seoul, Emirates Hotel Dubai, Sheraton Kuwait Luxury Collection and other regions. They also played together for a tour in Europe highlighting the fashion week of Vogue Italy. Guests are invited to indulge in an evening of music and cocktails to give a lift to the day, or enhance the experience with a glass of Champagne surrounded by the beauty of the art piece – “The Dance of Clouds and Rain” designed by leading Chinese artist Danny Lee. Enjoy the special offer on classic cocktails at Lobby Lounge and for only MOP58* chill out with a Mojito, Classic Martini, Whisky Sour, Caipiroshka or Negroni. *All prices are subject to a 10% service charge and 5% government tax. For enquiry or reservations, please contact +853 8868 1131.